If all computer technology was like the Drobo, there would be less people complaining that their tech is difficult to use or doesn't work. I've had my Drobo FS for three days, but man, I love the thing. It is such a pleasure to not have to worry about RAID arcana just to have your systems safely backed up. I bought the Drobo FS from Amazon (about $694 with free shipping) and set it up between yesterday and today. I installed the Drobo Dashboard, the utility program for the Drobo, on my MacBook Pro, rebooted the Mac, popped a combination of five 250GB and 500GB drives in, hooked up the power and the ethernet cables and fired it up. Drobo Dashboard saw the unit as it sat attached to my router. Dashboard asked me if I wanted to upgrade the firmware..so I did. 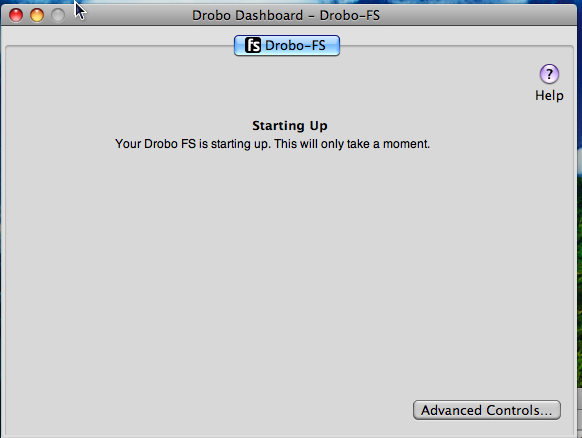 There was a small hiccup with Dashboard not seeing the Drobo after doing the firmware, so I had to hard power it down. But second time around, the firmware update worked. Dashboard then asked me if I wanted to upgrade the Dashboard software, which I did. I restarted the Mac. I then went into Advanced Settings -> Tools and configured email alerts to send me an email if Drobo becomes too full or has problems. Back in Dashboard, I created a couple of shares, one as backup for my main Linux video editing workstation and the other for my MacBook and TimeMachine. 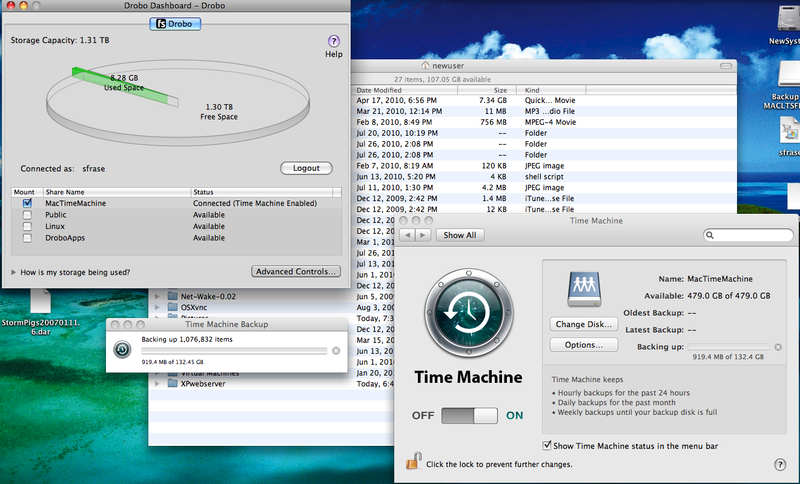 I setup my MacBook to use 500GB of storage as a TimeMachine backup. The TimeMachine hook up worked like a charm and started backing up. I decided to test it hard out of the box and ran that TimeMachine backup from the mac (connected wirelessly) coincident with a big copy from my Linux video editing box. On my Linux box, I mounted the Drobo via SMB/CIFS and copied over my 460GB archive. The backup of the Linux archive took about 3.5 hours at about 25MiB/s over wired ethernet. Not bad for over gigE and with contention from the Time Machine backup. The next morning, I got tired of waiting for the wireless TM backup of 130GB to finish, so I stopped the TM backup and then hooked up the Mac to a hard wired ethernet connection. Still took about five hours to copy over the remaining 80GB. I recently created a 760GB archive of my video workstation using fsarchiver. Copying the one file from my workstation to the Drobo took about 10 hours (8pm to 6am). That was with contention from a 40GB Time Machine backup that was running at the same time. Today I installed a few Drobo Apps (apache/droboutils/dropbear). DroboUtils is an easier way to manage Drobo Apps and as a prerequisite, it requires Apache to be installed. I used Apache for another function, setup of my personal website. I haven't cutover to using the apache web server as my main webserver yet because I need to tweak the apache config to hide some of the directory structures. 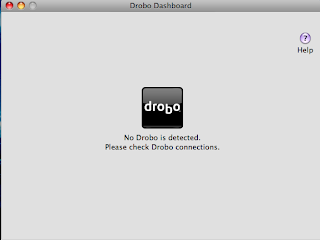 There is no telnet client for DroboApps, but DropBear is the SSH server for the Drobo. After installing, it was pretty cool to be able to logon to the device. All-in-all, the process was super smooth and the device is everything I hoped for. With the ability to expand drive space at will, I shouldn't outgrow the FS very soon. I'm also looking forward to using more Drobo Apps and letting that be my server, instead of my XP VM on my Mac! 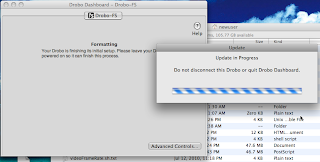 don't touch drobo while firmware is being updated! 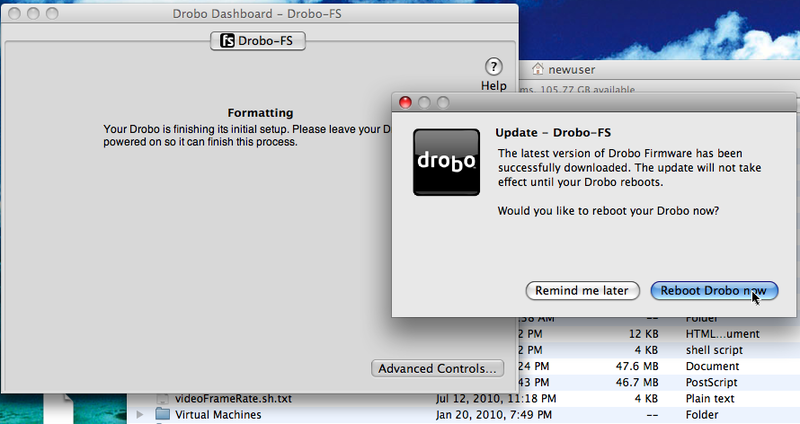 time machine backup using drobo! Hopefully you mean 25MB/s and NOT 25Mbps which means mega-bits-per-second. Semantics are a bit deal when working with the Mb's and MB's. I have a Drobo FS and I'm able to get about 27 MB/s or MBps, which is about 200 Mbps. Got it? In other words it's about twice the theoretical speed of 100/Base-t or 1/5th the speed of Gig-E.
Good eye. 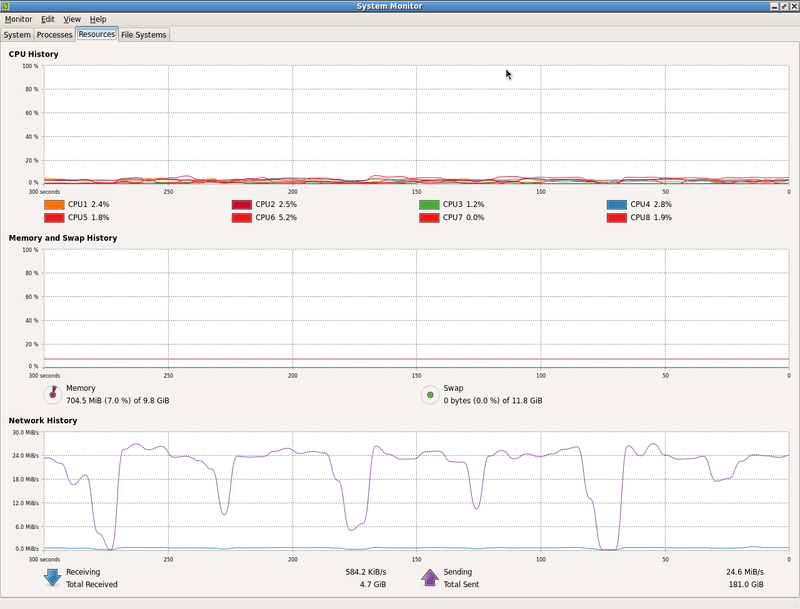 I am using Gnome's System Monitor program to determine the transfer rate from my workstation to the Drobo. Inadvertently, I fat fingered and dropped the capital B off my transfer rate. 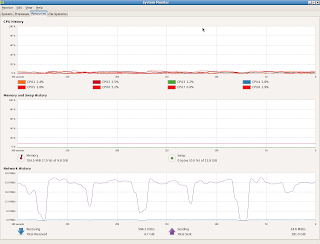 But then I got to looking at System Monitor graphic a little more closely (http://1.bp.blogspot.com/_bcLw_LVf5nA/TFdaeWrK4uI/AAAAAAAAA9Q/_0027O9jhec/s1600/drobo14.png) and found that the network monitor measures the utilization in Mebibytes (MiB/s). A Mebibyte is 8,388,608 bits per second. This is slightly higher than a Megabyte per second, which is 8,000,000 bits per second. 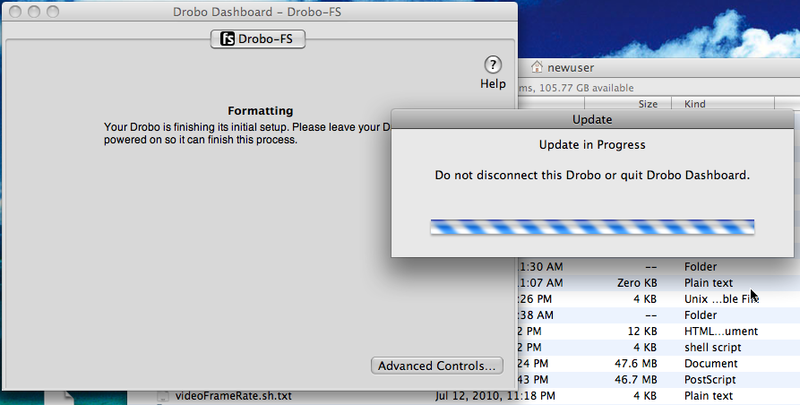 It's good to see similar results from you sodo, we have about the same setup: drobo-fs, gig-e, and use linux. I did try to increase the ethernet frame size to 3k but my unfortunately my switch doesn't have support, so did not realize any gains. I'm very interested to get linux ARM cross compiler setup to get some more server apps working on Drobo. Your links were very helpful to me in getting started. Thanks for the good write up! No problem. I'm actually going through those cross-compile instructions again at the moment, as I am setting up an ARM compile environment for some work on my Canon 5D's firmware. I don't do this often either, so I have to relearn.